So I guess we know what happens when PC goes up against the best team in the country. UConn put on a dominating performance in the second half of this game and Hasheem Thabeet threw a block party finishing with 10 blocks. So much for this one being a classic huh? Guess these Friars just aren't ready for the big time yet or maybe they were due to get their butts kicked by UConn in a payback type game after beating them 3 straight times and 4 straight on the road. I think I'm going to start calling Hasheem Thabeet, The Big Payback. As one shot after another kept flying back past their eyes, and the noise inside Gampel Pavilion filled their ears, the Providence Friars developed one big collective headache yesterday. That’s what can happen when a roadblock named Hasheem Thabeet and his Connecticut Husky teammates are clicking on all cylinders. The Huskies did that and more as they broke open a four-point game at the half with a dominating final 20 minutes and breezed to a 94-61 victory. Thabeet started swatting shots right out of the gate and never stopped. One Friar after another kept challenging him, but to no avail as the 7-foot-3 Tanzanian finished the game with a triple-double effort of 15 points, 11 rebounds and 10 blocks. Paced by Thabeet, UConn held Providence to 28 percent (10-of-35) shooting in the second half and 33 percent for the game. The Huskies began the second half on an 11-0roll and never looked back. The Friars (14-7, 6-3) came into the game with plenty of confidence in a plan to hinder Thabeet’s effectiveness. PC was hoping to continually bring its own big men into a high pick-and-roll set that would draw Thabeet away from the basket and allow the Friars room to attack the basket. But Thabeet did a good job of moving his feet and retreating to the rim and was absolutely dominant whenever a Friar tried to challenge him. Marshon Brooks, who had to have at least five of his shots knocked away, typified PC’s frustration as he frequently turned to his bench with quizzical looks after his scoring chances were forcibly denied. What compounded PC’s second-half woes (when it was outscored by 29 points) was that Thabeet was hardly alone. UConn blocked 17 shots in total and its offense was sparked by the shooting of A.J. Price, who made three of UConn’s five 3-pointers and scored 19 points. Stanley Robinson awoke from a season-long slumber and scored 18 points, and Jeff Adrien added 14 points and six rebounds. UConn improved to 20-1 and 9-1 in the Big East. With No. 1 Duke and No. 3 Pittsburgh both losing this week, UConn is the heavy favorite to vault into the top spot in the polls just before it travels to Louisville and faces the red-hot Cardinals Monday night. ``We’re happy to be number one but only in the sense that it’s a little niche and something in passing during the year,’’ said Calhoun. 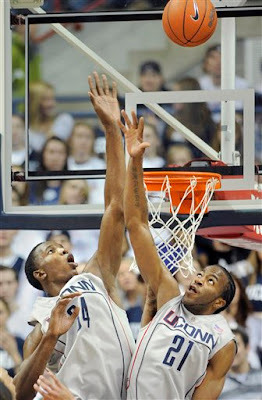 The game began with PC showing the poise and offensive patience that marked their impressive 6-2 start to Big East play. The lead changed 10 times in a well-played first half that featured some strong UConn defense highlighted by 10 blocked shots (5 by Thabeet). The Friars continually got to the rim but Thabeet and friends kept denying the visitors at every turn. The Friars trailed 38-34 at the half. They shot 37 percent in the half but 50 percent (15-of-30) on shots that were not blocked. That accuracy changed dramatically after halftime. PC missed four jump shots and had a Brooks floater blocked by Thabeet before they scored a bucket in the half. UConn scored 11 straight points to go up 49-34. Threes by Brooks and Brian McKenzie made it 51-40 but UConn kept rolling with strong, physical defense that eventually drew the ire of the Friars as both Kale and Geoff McDermott were slapped with frustration-filled technical fouls. Davis wasn’t happy either, especially when he looked at the officials at the 10:47 mark and pointed out that PC had been called for six fouls and UConn had zero.